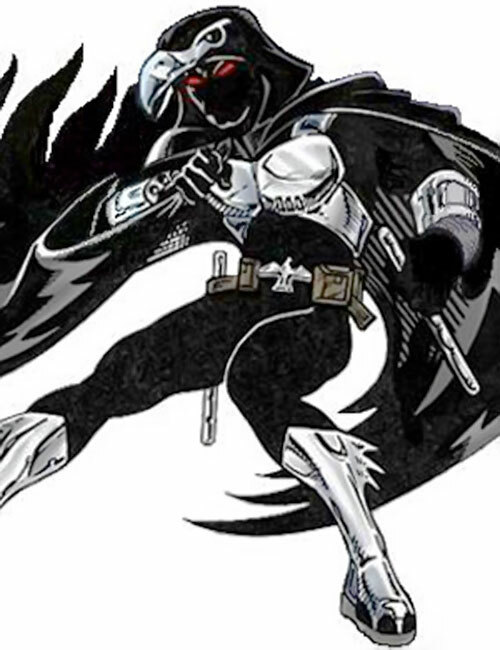 This Batman expy appears in the fifth edition of the Champions super-hero role-playing game. Base Of Operations: Millenium City, Michigan. Eyes: Brown ? Hair: Brown ? Other Distinguishing Characteristics: Noticeable scars on face. Nighthawk is a naturally gifted athlete and fighter. He has the well toned build and endurance of someone who engages in intensive training and exercise. He’s studied martial arts with several world-renowned masters and also become an accomplished acrobat. He can analyze a crime scene, pick locks, and operate just about any type of computer or electronic system. Nighthawk has built several devices to help him fight crime. His Combat Vest is a slim, high-tech chestpiece. It interacts with special fibers in his costume to generate a low-level, invisible, force field to protect him from bullets, energy blasts and other attacks he may encounter. His left bracer and mask contain communication technology. The right one contains a swingline shooter. His utility belt contains numerous other useful devices. While he prefers to battle hand to hand, using his martial arts and batons, he will often enter combat with a volley of thrown weapons. When outnumbered, he often uses his mask’s thermal vision and some smoke pellets and in order to maintain his vision while blinding his opponents. If his usual attacks are ineffective, he will resort to surprise attacks and other maneuvers to gain an advantage. Mark Whitaker was a college student who seemed to have it all. He was not only handsome, athletic, and popular, but academically gifted as well. Even as an undergrad, his projects in computer science attracted attention from both scientists and major corporations. That this young man would go on to be highly successful was practically a given. Fate, for better or worse, intervened. One day, while he was headed into the computer sciences building, VIPER attacked. The criminal organisation was intent on stealing some valuable electronic components. Unwilling to stand by and do nothing, Mark charged into the fray. He took down two enemies before being caught by the explosion of a grenade and knocked unconscious. He awoke in the hospital, his face heavily bandaged. He soon learned that his face was badly scarred. Not enough to render him hideous, but certainly enough to mar his once-handsome features forever. Also, while he had foiled part of the robbery, VIPER still got away with much of what they came for, and the police had no idea how to find them or solve the crime. Forced to lay in a hospital bed to convalesce, Mark’s mind seethed with anger. He wasn’t so upset about his injuries as he was about the injustice of the situation. What kind of society did he live in that criminals could get away scot-free? It wasn’t right. By the time he was released from his doctor’s care, Mark was a changed man. Gone was the happy-go-lucky academic star, replaced by a man driven to fight injustice and evil. Dropping out of school, living on money from a few inventions he had already patented, Mark set out to right the wrongs of the world. He trained relentlessly in crimefighting disciplines, ranging from criminalistics to martial arts to infiltration. He also took time off only to design special devices to aid him in his special mission. Within two years, there was a crimefighter on the streets who called himself Nighthawk. 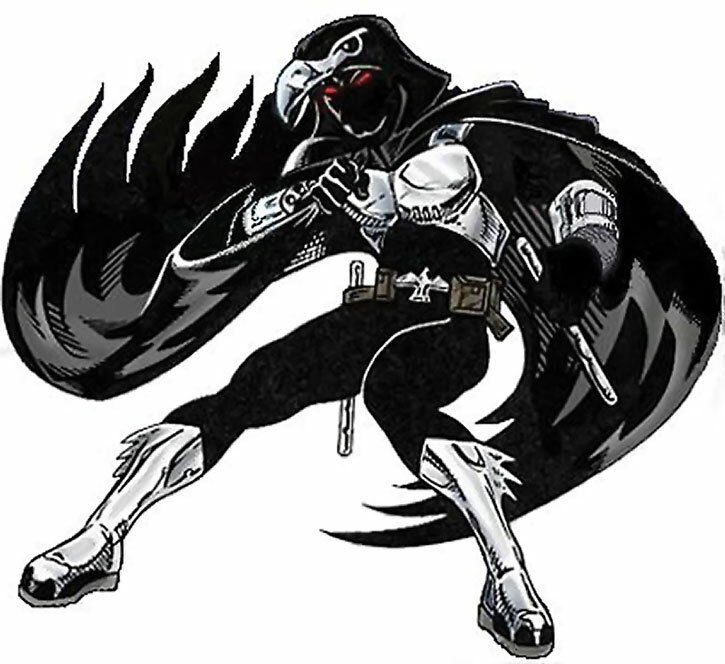 An avian shadow, clad in silver and black, he swooped down upon criminals and beat them senseless, soon earning a reputation for his intensity… and brutality. Nighthawk’s costume is silver and black. The base bodystocking, full head mask, gloves, and cape are black. The bottom of the cape is cut in a feather-like pattern and the hood goes on to form a hawk-like shape, with the beak and eyes in silver. His vest, utility belt, bracers. The batons and boots are silver as well. The thick-soled boots sport a talon-like pattern across the toes and there are three downward pointing prongs along the outward side of each upper calf. The combat vest covers his upper chest, but is cut slim enough so that it neither impedes his movement, nor distorts his outline when hiding in shadows. Nighthawk is tough, intense, and self-assured. He’s met few obstacles he couldn’t handle – either on his own or with his teammates. He approaches his work with absolute confidence. Should he discover that an opponent is too much for him to handle, he will withdraw, develop a plan, and come back to take his enemy down. He has no qualms with expressing his opinions or tackling doing things on his own if he feels his teammates don’t know what they’re doing. 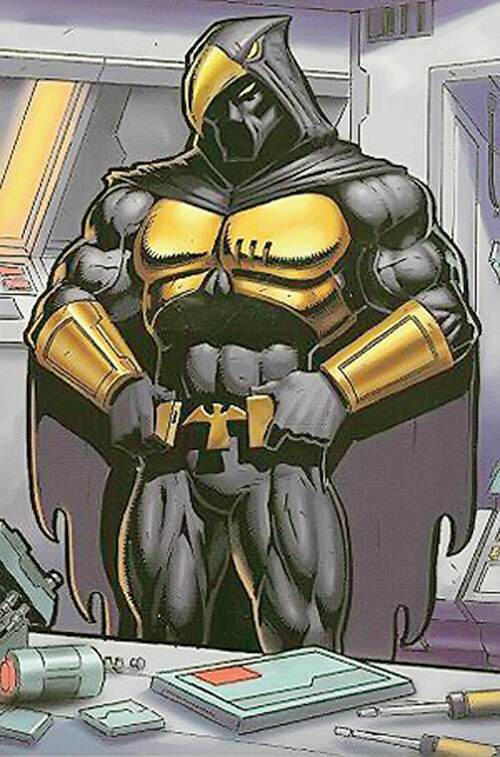 Given his obsessive nature, Nighthawk tends to regard his teammates as well-intentioned but amateurish. Although Nighthawk genuinely likes and admires Defender, he sees him as something of a rival, both for leadership of the team, and as an inventor and engineer. While aware of Nighthawk’s attitude, Defender doesn’t share it. Content to lead by example, he doesn’t care who knows the most about electronics. That said, Nighthawk is perhaps the most dedicated of the Champions, though also the one with the poorest reputation in the minds of the public. While he does maintain a secret identity, he still tends to spend most of his time either fighting crime, or preparing to. His teammates worry about him, afraid that he’ll carry his one-man crusade too far, but he seems to be in control of himself… for now. Nighthawk, much like his namesake in the Squadron Supreme, is an obvious Batman analogue. Perhaps he was another member of the Detroit Justice League. Ambidextrous, Double Jointed, Genius, Intensive Training, Iron Nerves, Lightning Reflexes, Reputation, Leadership, Scholars (Computers & Computer Systems, Electronics), Schtick (Paired Batons). Dependant (Julie Morgan, Crime Reporter, Girlfriend), Distinct Looks (facial scars), Enemy (VIPER), Enemy (Mechassassin), SIA toward Crimefighting, SIA toward Overconfidence, Minor Rage, Secret ID. COSTUME [BODY 06, Radio Communication: 11 (Left Bracer and Mask Radio), Snare (Swinglines): 04 (Right Bracer), Thermal Vision: 08 (Mask Lenses)]. COMBAT VEST [BODY 09, Force Field (Concealed, personal only, may attack thru): 04]. Rebreather [BODY 01, Sealed Systems (not vs. Radiation): 10]. Monocular [BODY 02, Telescopic Vision: 06]. Mini-camera [BODY 01, Recall(Visual): 12]. Battle Baton (x2) [BODY 10, EV 03 (05 w/Str(also if thrown), 09 w/Martial Artist)]. Smoke Pellets [BODY 02, Fog: 06, Ammo: 06 (Grenade Drawback)]. Flash Pellets [BODY 02, Flash: 06, Ammo: 06 (Grenade Drawback)]. Thermite Pellets [BODY 02, Pyrotechnics: 03, Sharpness: 06, Ammo: 06 (Grenade Drawback)]. Sleep Pellets [BODY 02, Knockout Gas: 06, Ammo: 06 (Grenade Drawback)]. Weakness Darts: [BODY 01, EV 01, Power Drain (STR, Drain only (no transfer): 06, Ammo: 06 (Grenade Drawback)]. Throwing Blades [BODY 06, EV 02, Dart Bonus, Ammo: 06]. I played with the stats on this one a good bit. He’s supposed to be rather tough, but the HERO stats, while above average, weren’t remarkably so. 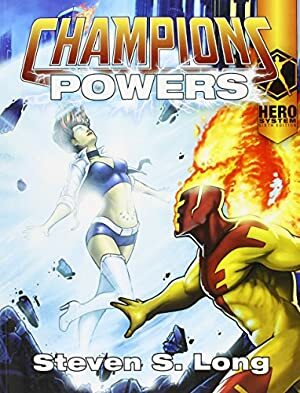 Source of Character: HERO Games’ Champions products, 5th ed Champions sourcebook and Reality Storm (joint HERO & SAS adventure) specifically. Helper(s): Sébastien Andrivet (minor technical tweaks about the equipment).